Auto industry legend J.D. “Dave” Power III, co-founder of J.D. Power & Associates, will become the ninth member of the Pacific Coast Business Times’ regional Business Hall of Fame. 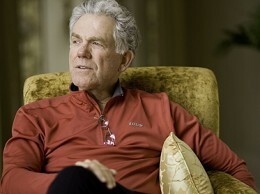 Power and the rankings produced by the firm he founded, Westlake Village-based J.D. Power & Associates, have been hugely influential on the auto industry. Power’s pioneering efforts put the consumer in the driver’s seat by measuring customer satisfaction with new vehicles. That innovation was critical to breaking the manufacturing mindset that dominated the industry for decades and led to the end of Detroit’s run as the global center of all things automotive. He will be featured in an article in the Business Times’ 101 One Hundred and Business Hall of Fame special report, publishing on April 25. The special report also features the 100 largest private and public companies in the Tri-Counties. An awards reception will be held at the Four Seasons Resort the Biltmore on May 29 to honor Power and the companies featured in the section. In honor of the Business Times’ 10th anniversary, the Business Hall of Fame was launched for the Ventura, Santa Barbara and San Luis Obispo county region in 2010. After the five inaugural members — Jeff Henley, Carrol Pruett, Michael Towbes, Martin V. Smith and Jack Gilbert — were inducted, the Business Times has continued to add one person each year. Hank Lacayo and Peter Jordano were inducted, followed by Sara Miller McCune last year. Pacific Coast Business Times is the award-winning weekly business journal of record for the Central Coast of California. Now entering its 15th year of publication, the Business Times produces weekly print editions, 24 special reports and eight awards events each year. The Business Times’ summer lineup of events includes Champions in Health Care in June, Latino Business Awards in July and Spirit of Small Business in August. • To buy tickets to the Hall of Fame awards reception, contact Jennifer Carusa at [email protected]) or (805) 845-2697.